Hemkund is only arround 5 km away From Ghangharia, regarded as a spiritual power place. 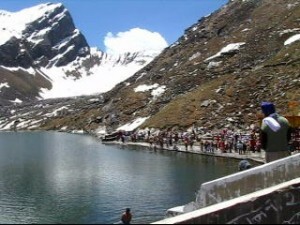 The Hemkund Lake is (about 2 km in circumference) a wonder at the first sight. The frozen lake and virgin snow around are absolutely breathtaking. Saptashringa Peaks (5,500 m) is reflected on its cristal clear water. As far as the vision can go, the valley, the mountain slopes, there are flowers, flowers and flowers. More than a thousand Himalayan varieties of flowers, ferns, and herbs are found in the valley.The waterfalls dives from the mountainsides is truly beyond description. Best time to visit the place is between July and September. This entry was posted in Hemkund, Uttaranchal and tagged Hemkund, hemkund india, Hemkund Lake, Hemkund Saheb, hemkund sahib tour, hemkund sahib trek, hemkund sahib yatra, hemkund yatra. Bookmark the permalink.